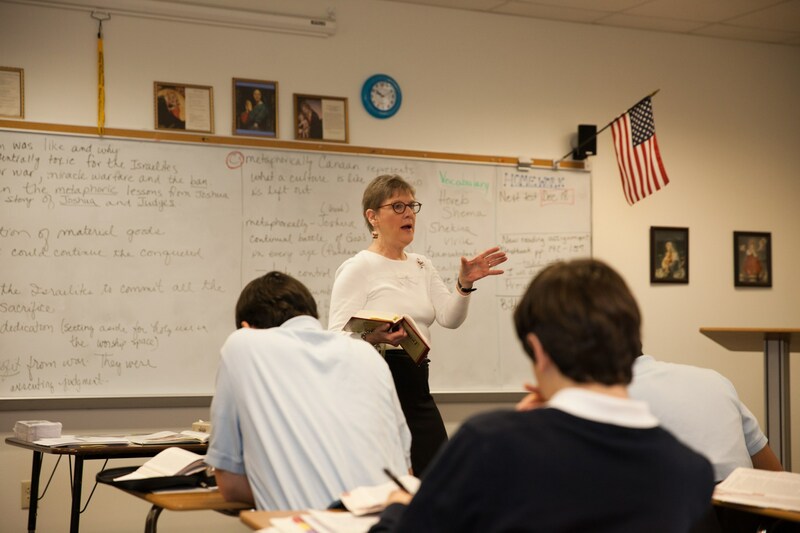 The curriculum of this college preparatory school is organized on three levels, generally described as a) standard college prep, b) honors, and c) Advanced Placement (under guidelines of and in compliance with the C.E.E.B. requirements). Most students will be appropriately challenged in our standard College Preparatory courses of study. For the student who has a demonstrated aptitude and/or interest in pursuing in-depth study in a particular area, honors courses offer a greater challenge and move at a faster pace. Accordingly, one (l) additional quality point is added to the grade point average for each honors course in which the student is enrolled. Advanced Placement courses are offered to the student who has demonstrated academic ability which is well above average in a particular field of study. The student must have a demonstrated capability for learning new concepts quickly and for mastering material which is treated in a depth appropriate to a college course of the same scope and sequence. It is understood that the mastery demonstrated by an Advanced Placement student will require a great deal more time devoted to study, to reading and to writing than is expected of students in either standard college preparatory or honors courses. The A.P. student is required to take the national A.P. exams in the subject at the end of the year. These exams are nationally standardized in follow-through to the study of the nationally standardized curriculum in that subject. [There is a fee for this exam.] Most colleges/universities will award some college-level credit in the subject to students scoring a 3, 4, or 5 on the exam (the grading scale being l-5). Two (2) quality points are added to the grade point average for each A.P. course in which a student is enrolled. Colleges generally expect that a student maintain an “A” or “B” average in the high school courses they are taking; therefore, it is important that the student be committed to maintaining this standard in his/her performance. If s/he is not, placement in higher-level courses becomes a detriment to the student’s progress and on the student's record. Students successfully completing a substantial number of honors and Advanced Placement courses according to the school’s curriculum classification guidelines will have an Honors notation endorsement on their transcripts and receive appropriate recognition at the time of graduation. The Learning Support Program (LSP) at Bishop McGuinness is dedicated to providing services to students who have specific identified learning disabilities. Students are eligible for services from the program if they have a documented “Learning Disability” detailed in a valid psycho-educational evaluation, not more than three years old. We encourage our students to learn to recognize, appreciate and develop the positive aspects of their learning differences. BMHS makes an effort to create an educational environment which is inclusive for every one of our students. By having support services that will enable you to become a better student we are ensuring that you will receive every opportunity to meet your needs and your expectations. Bishop McGuinness accepts for high school credit all courses offered by other accredited institutions or agencies for which the student has received BMCHS approval in advance. Such approvals are given for make-up and enrichment opportunities or for courses which the school Administration deems advisable as alternatives for particular students to courses which are a part of the standard BMCHS curriculum. In awarding such credit, the school enters the course on the student's BMCHS transcript with the appropriate notations. Such opportunities include, but are not limited to, on-line courses, courses in the community colleges and other colleges/universities in which high school students are permitted to enroll (such as in so-called concurrent or dual enrollment programs), and courses offered by other high schools in summer sessions.